Mainly thanks to the gorgeous Lipstick Rules I bought NARS Pop Life Velvet Matte Lip Pencil in Liberty yesterday, and while I was there I very graciously allowed the Sales Assistant to convince me to hand over some hard earned cash for the Skorpios Soft Touch Shadow Pencil too … just kidding, the sales assistant was adorable, and very sweetly left me to my own devices while convincing me that I didn’t, in fact, need Cruella too! I do need Cruella too, but it can wait a month or two (are you reading this, Santa?)! Pop Life is a gloriously cheery orange-red with tiny hint of gold sparkle, and Skorpios is a deep and shimmery coppery-bronze shade. Both pencils are beautifully soft and silky on the skin and not dry or powdery. 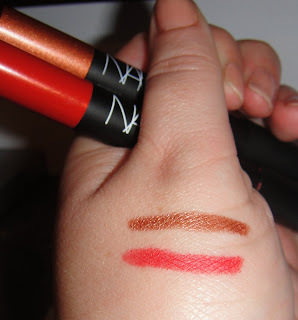 The lip pencil does work better with a touch of gloss over the top, but it’s not necessary. I’m wearing Skorpios all over the lid, and up to the brow bone, I’ve added a touch of NARS Galapagos at the outer corner, I’ve lined the upper waterline with MAC Feline, and finished with Clarins Wonder Perfect mascara. The pencil took literally seconds to colour and blend, and it wore pretty well throughout the day with only minimal creasing on the lids (I didn’t use a primer, as I wanted to see how the wear was on the product itself). I’m always a bit wary of cream-shadows, but I’m pleased with this one, and I think I may check out more of them. I think NARS is really breaking my brown-aversion! Glad to see I'm an 'enabler.' LOL. I LOVE Pop Life on you!! You did a much better pic of it here than I did. The colour is amazing. Next you must try Babe gloss on top and you will fall in love with it all over again. Pop Life! You can't go wrong with a Prince song for your lipstick! I will now be singing this for the rest of the evening.